Experience People's Choice Awards nominee "Bones" in a whole new way with never-before-seen footage not available anywhere else! While she tackles some of her most gruesome homicide cases yet, Dr. Temperance Brennan (Emily Deschanel) also faces the delicate demands of motherhood, and a deepening relationship with FBI Special Agent Seeley Booth (David Boreanaz). The thrills escalate this season when a pastor's wife goes missing, shipping clerks go postal, and the squints go Hollywood. But the biggest shocker of all comes when clues left by a deranged cyber genius tag Brennan as a murder suspect. Here are all 13 Season 7 episodes with plot twists, mystery, romance and humor to die for! 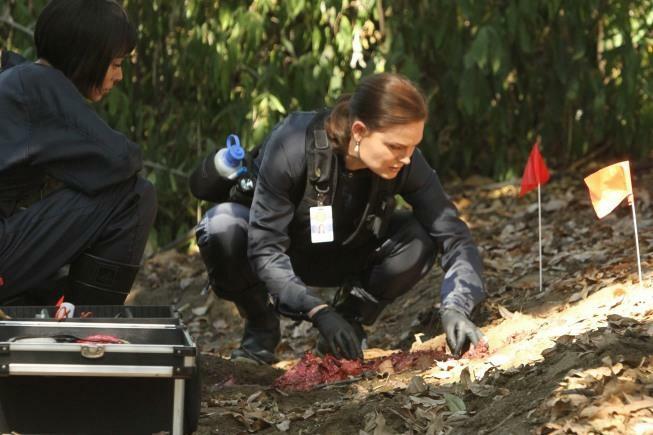 The Memories in the Shallow Grave – Brennan’s pregnancy is a big adjustment for her and Booth while a murder victim is found in a paintball field. The Hot Dog in the Competition – A Competitive Eating Champion is found dead. Intern Finn Abernathy joins the team of squints, but he has a past that makes his co-workers nervous. 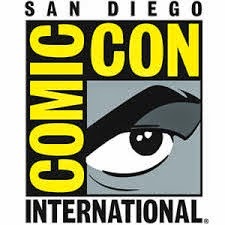 The Prince in the Plastic – A Toy Company Executive’s body is found shrink wrapped while “Sweets” needs to pass weapon certification. The Male in the Mail – While investigating the murder of a copy store employee Booth learns that his estranged and formerly abusive father has passed away. The Twist in the Twister - A storm chaser is dead, but Angela and Hodgins have personal problems when her father visits and wants to babysit. The Crack in the Code – A murder has taken place at a national monument and all the team has to go on is a coded message. The Prisoner in the Pipe - A prisoner is found dead in a sewer but evidence reveals he was killed inside the prison he escaped from. Brennan feels comfortable but Booth is uneasy as she walks through the prison collecting evidence. In this episode Booth becomes a father. The Bump in the Road – An extreme couponer is dead and guest star Tina Majorino assists with the investigation. 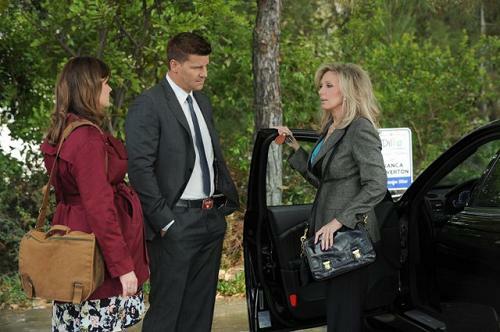 Brennan heads back to work after giving birth to a daughter. The Don’t in the Do – A blue body is found in a landfill and the team heads to a hair salon for answers. The Warrior in the Wuss – A body found in the woods leads Booth and Brennan to a karate class. The Family in the Feud – Two feuding families are at the center of a murder. The Suit on the Set – Booth and Brennan consult on the movie version of Brennan’s book where a prop body is determined to be a real corpse. The Past in the Present – Christopher Pelant, genius techie has murdered Brennan’s friend and points suspicion at her. 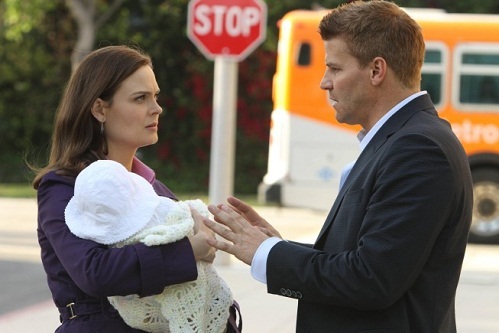 Much of this season is devoted to the drama between Booth and Brennan finally getting together, resulting in her pregnancy. They are house shopping, preparing for a child, and dealing with his son from a previous relationship. I like the crime fighting and murder solving aspects more than the relationship stuff. The previous seasons were full of tension between Booth and Brennan and it’s a lot less interesting to see them actually together. I don’t really buy them as a couple either. Brennan isn’t hot enough for Booth. Christopher Pelant, who is highlighted in the final episode, is however very interesting. Christopher Pelant is featured heavily in the following season and you definitely should watch season 7 to prepare you for season eight. It appears to me that the season stopped abruptly and not where the writers would have intended. 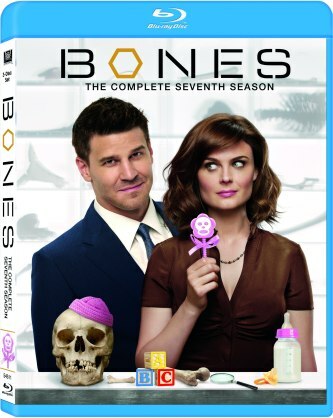 "Bones the Complete Seventh Season" is presented on Blu-ray with a widescreen 1.78:1 ratio. The show looks pretty good overall in daylight, indoors and at night. Its comparable to watching it as it airs on my HDTV. Skin tones are consistent and detail, specifically in the actors faces and clothing is good. There are many bloody bodies that come with varying shades of red, all realistic. 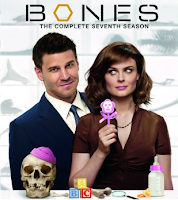 "Bones" is presented in English DTS-HD Master Audio 5.1 sound. Mostly dialogue driven, the volume is consistent and the actors are always intelligible. There are some gun shots and sounds effects that come across as authentic. This isn't the Blu-ray to use though if you’re trying to show off your sound system. The special features aren't all that interesting as a whole, especially "Bone of Contention on the Red Carpet." I’d prefer more behind the scenes footage, not more of the actors in character. Deleted Scenes - Deleted scenes from the Memories in the Shallow Grave and The Past In The Present are found on their respective discs. Creating The Suit on the Set – A featurette about the episode where Bones’ book becomes a movie. Bone of Contention: On the Red Carpet – The cast stays in character as they arrive at the premier of the ficticious movie based on Bones’ book. Audio Commentary – Commentary on The Past In The Present that is more interesting than I expected, especially the discussions about directors and their different styles. Gag Reel – The cast being silly as they mess up their lines. I used to wait with anticipation for the next episode of "Bones" to appear in my DVR. I don’t do that anymore, but I’m still watching it and I’m usually entertained. Season seven really starts to get good when Christopher Pelant becomes a major player and that’s just as the season ends. Had the season gone the full 20 or 22 episodes, I think I would be raving about it. It’s still worth watching, it has some good episodes, and it prepares you for season eight, so Bones fans should definitely watch. If you’re not a fan, starting with season seven probably won’t turn you into one.